The very racing writing I ever did was for Rene LaBerge, who ran the Catamount Stadium program in the 1970’s. I ended up with the responsibility of covering a support division called the Grand Americans. Ken Squier and Tom Curley had not know what to do with their automatic transmission Hurricane Division, which had about reached the end of its technological potential. What they came up with, around 1976, was calling the support class “Limited Sportsman” for a year and letting the established Hurricanes run in the same races with a new class of small, six – cylinder – powered cars. to have you in their way. Ironically, Norm would also be the last dominating Grand American driver, in 1979. By 1977, the Hurricanes were gone and the division was dubbed Grand Americans. Mostly Mustangs and Camaros, the new cars not only had developed some new stars, but several of the old hands with the hefty , thundering Hurricanes came over to the six bangers and helped the new class to keep its fan base. Car Nelson, Richard Buzzi, Jay Yantz, Dave Gibbs, and Larry Caron were a few of the old Hurricane drivers to build or buy a Grand American car; others like Perry Poquette, Milo Lockerby, and Norm Andrews chose not to get on board. To go with these more familiar names, some new faces came onto the scene. In particular Tom TR Waters, a Washington, Vermont man who had been active briefly in the Hurricanes on the crew of Dennis Tucker, was coming in with impressive equipment. So, too, was the local Milton man, Jimmy Barton, who came in from the very beginning with a distinctive blue Camaro. Graniteville’s Paul Donahue brought a distinctive Mopar into the mix; George McRae was working on an AMC car; and Dave Gibbs would use Fords. 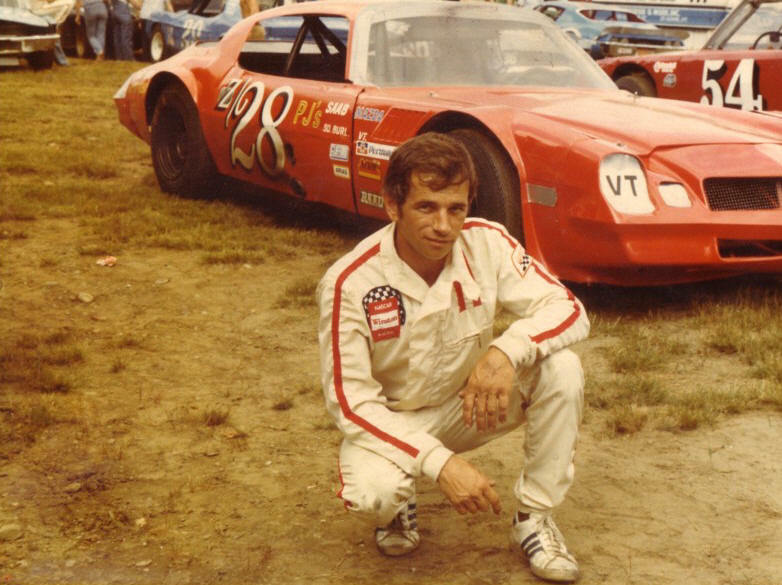 Rough and ready Milton native Jim Barton was the first six cylinder car onto the track at Catamount during that first season. The choice of names for this class of pony cars could have come from NASCAR’s semi – big – league class which featured the same kinds of cars [although not with sixes]. It first called them Grand Touring cars, but sounded too much like the international road racing bunch: so, they settled later on Grand American. This was not actually original to NASCAR. Harvery Tattersall had used the term for a class of cars he ran in the Northeast that used a lot of his Riverside Speedway regulars and which was a poor man’s imitation of the NASCAR Grand Nationals. TR Waters’ potent Camaro at Barre, with the Barton car in the background. T R says that, when the word came out about the division, he set about building a really good one right away, in the same garage in Washington as Tucker – who had, by that time, purchased a Dave Dion Ford Torino and was ready to try the late model sportsman division. Tucker had been a real force in the Hurricanes with a Ford, as had his close friend Richard Buzzi. Now Buzzi would head for dominance in the sixes and Tucker would struggle with an under – funded LMS campaign. other Grand Americans. Note the closeness of the group, with rival Larry Caron’s ad on the side. Henry Van Acker is ahead of Buzzi, and Jay Yantz is first on the track for practice. The division started out slowly, as would any new class of racing. The head start afforded to that handful of teams who chose to run with [and get pushed around by] the well – established Hurricane cars in that single limited sportsman season helped to lend some stability in 1977. Chelsea’s Charlie Ladd, a friend of Waters and a man not known for towering racing accomplishments, won the inaugural Grand American feature. But, the class of an already – impressive division was Larry Caron, Richard Buzzi, Jay Yantz, and Henry Van Acker. The division was fascinating, if one took the time to actually pay attention. Although the Chevy Camaro was the most plentiful and arguably the most successful, Yantz was very strong in the #64 Mustang, and George McRae [and later, brother, Barney] was fielding a particularly impressive AMC effort. Sponsored by the local Buyers Digest paper, he actually fielded a white model and his familiar orange car at very times during the year. Dave Gibbs [above] and George McRae kept the AMC cars in the spotlight. 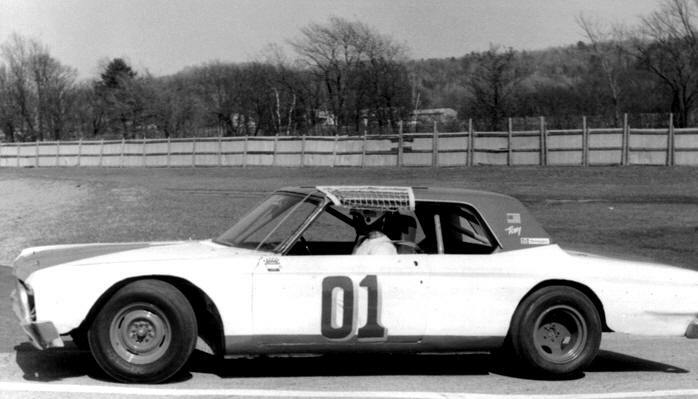 Below – Jay Yantz’s Mustang led the Ford contingent and Paul Donahue ran one of the only Mopars in the Grand Americans. The Grand Americans were populated with a good mixture of teams. Besides the aforementioned, there was New Yorker Bob Wood, Vermonter Monty Jarvis, Dave Gibbs, and Mopar driver Paul Donahue. 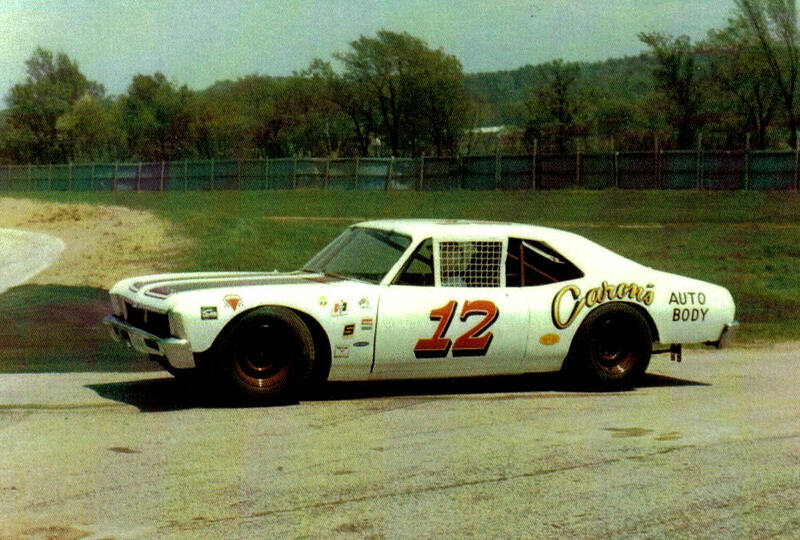 Woodstock’s Bruce Jaycox fielded a full – bodied Ford Fairlane with more success than one would expect for a car of that weight. 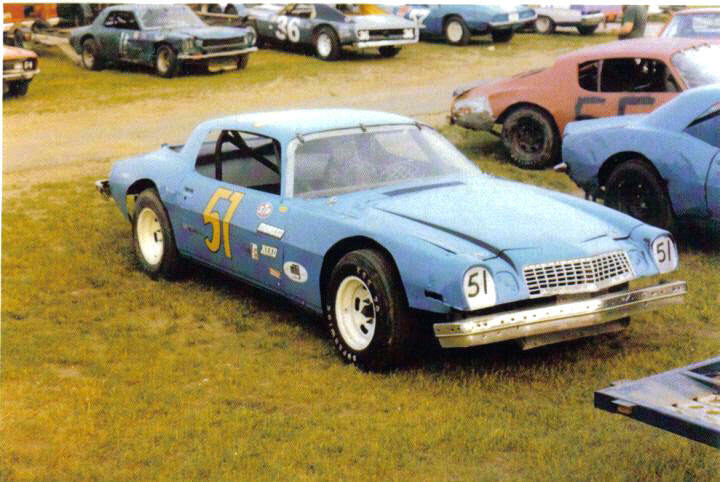 Future two – time Busch Grand National North star Jamie Aube fielded a Camaro, and his North Ferrisburgh neighbor, Harry Rathburn built two almost – identical Camaros, painting them in an unusual brown and yellow scheme. Rathburn’s cars would be starter opportunities for such later stars as Kevin Boutin, Greg Lyman, and Aube. The division, while dwarfed in attention by the burgeoning late model sportsman tours concept, definitely had its own story lines and drama which wads entertaining to those who took the time to observe. The first big story was Richard Buzzi and his chirping Camaro. Only a few people know what Buzzi did to his car to have it produce a characteristic chirpy sound, but – whatever it was – the car was darned near untouchable. Buzzi would be the champion for the first two years, in the face of some very competent rivals. Harry Rathburn’s team car draws quite a crowd of the Who’s Who in Catamount Support Divisions for that time. Buzzi would face continual scrutiny because the car seemed to be from another class entirely. Soon, Waters and driver, Larry Caron were under the same gun. Competitors without the technical know – how [and perhaps the budgets] were tiring of having to race for third or fourth, while the super teams always finished up front. Waters says of that scrutiny: “I wish I had a dollar for every time I had to tear the car down at Catamount. Pull the starter to check flywheel. Pull the fuel pump to check for aluminum rods. Pull the head to check bore and stroke and valve size. Lenny was pretty good about it all. He had been around it long enough so that he knew the motor wasn’t all of what was making that car win races. Official Bubby Wilder strolls by as Richard Buzzi chats with Deb Armstrong, a long - time supporter of racing in northern Vermont. The son of legendary flathead racing mechanic Libero Buzzi , Richard spun a brilliant wrench, himself. Buzzi was an enormously popular figure in the pits at Catamount and Thunder Road. I recall a very close relationship that grew up between his boys, Louie, Cassani, Tank, and Harv, and the tough crew of Jimmy Barton, from Milton. Buzzi would help anyone, if he had time. Waters still keeps one incident with Buzzi fresh in his mind, almost thirty years after it occurred. He was leading a race at Barre with Buzzi content to ride around behind him. Tom kept giving him room, knowing Buzzi could blow by anytime he chose to. Waters remembers looking in the mirror and having Richard raise a finger to him, signaling to go ahead and take the win. Tom says Buzzi knew he hadn’t won a race and was willing to let him finish in first that night. As it turned out, Tom was not going to accept a win that way and was ecstatic to finish second to Buzzi. The cars the two or three top cars were running were more complicated than was apparent to the casual observer. They had to run a stock type intake and exhaust manifold when the div started. A 292 truck ex manifold was the hot item. Some guys ran 2bbl adapters on the intakes; others, like Waters, opened them up a bit and had a plate welded to the top. Bruce Jaycox, from all the way down in Woodstock, VT had one of the most unusual Grand Americans – this big Ford. 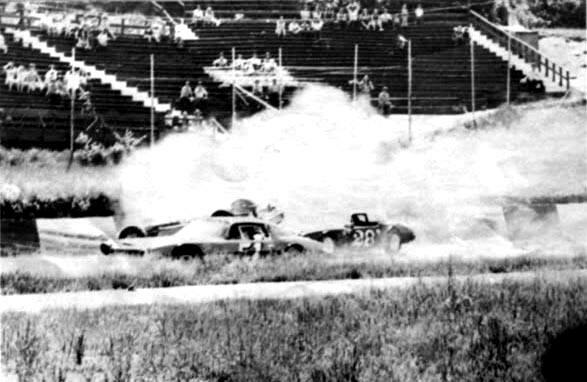 Note the sponsorship from soon – to – be LMS star Allen Whipple’s salvage company. 34 years later, Bruce still races near home. A lot of those cars had their own distinct sound. While referring to the peculiar sound of Buzzi car, Waters explains that - because of the way he built the interior in the Z28 car ( and to keep from smashing the exhaust), his driver, Caron, built what amounted to 180 degree, over the bellhousing headers. The only other car they had heard with that sound was the 6 cylinder Bear Ridge car Waters built..... because it ran the same type of headers. 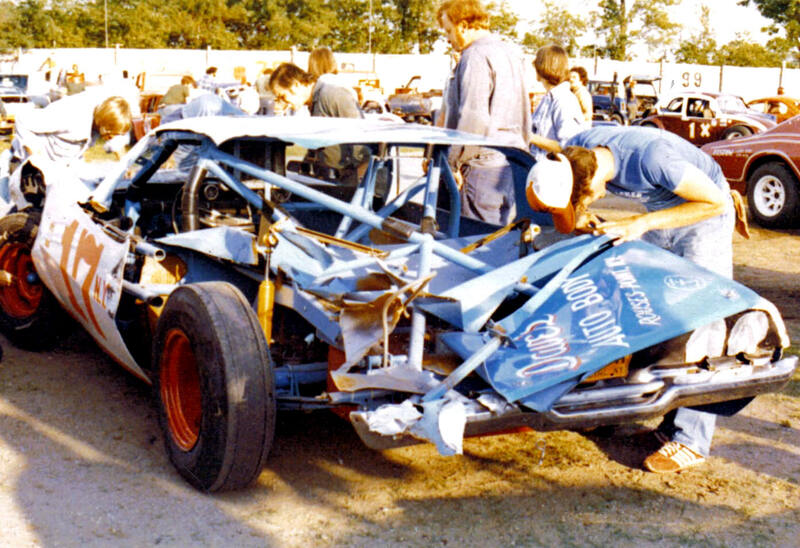 Vance’s Howe car fared much better and suffered less body damage when Buzzi got in in 1979. But, the core of the Grand American competition had been gutted for a while. Also visible here are the 36 of Larry Lambert, Barton’s 57, and unknown pulverized 11, and Lanny Covey’s rough – looking 55. 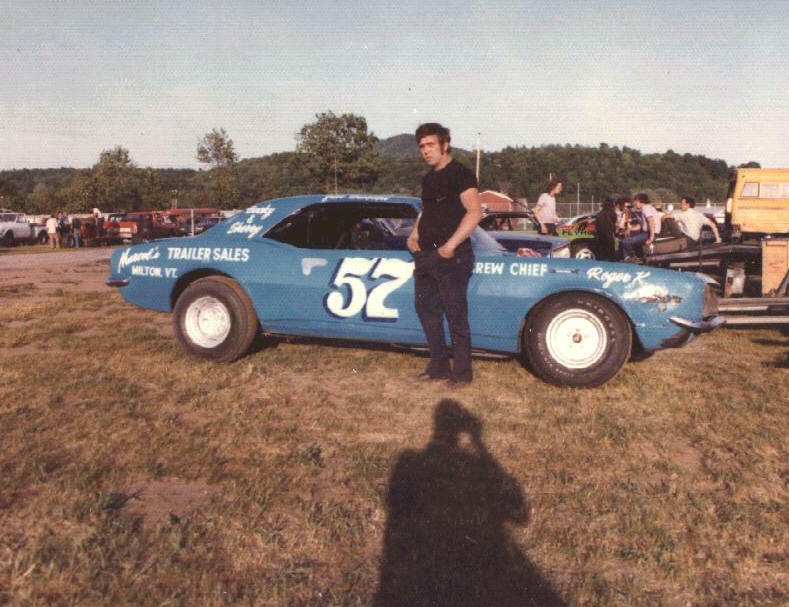 Probably Daryl Chapin next to the 51. 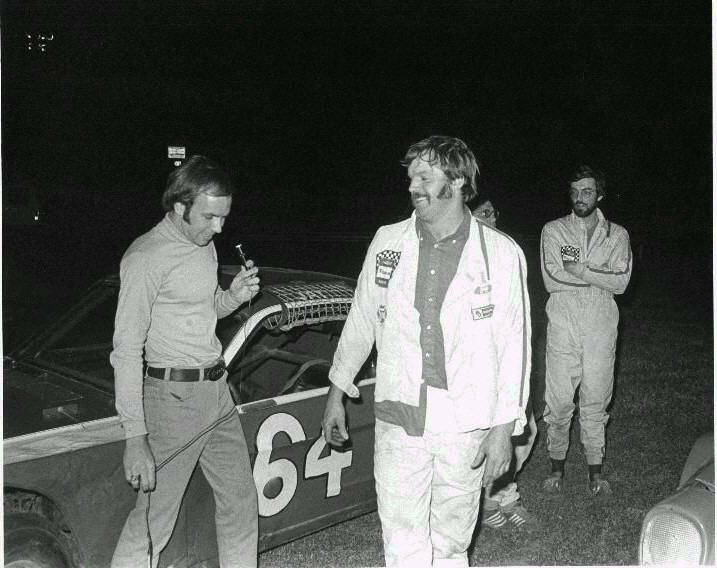 Waters wrote me, concerning Vance: “We ran the Z28 car with 3.70 gears at Catamount. We were very close to the rpm limit. I had three different 3 speed transmissions that all had different gear ratios. We raced a few times at Catamount with Vance and crew. I think Brother Eastman was driving it for him. Anyway, we decided to change the rear end to a 3.43 ratio to get the rpm down just a bit.. so the car would pull down the whole straightaway. Along with the rear change, I changed transmissions to get closer to an effective 3.55 ratio or so. The car flat out flew. Enough so that Jim noticed and came over asking what we had done. "You must have changed gears" . The Vance car won infrequently, and it looked like it had been through the dryer at a huge Laundromat by the end of the season. The next year, Buzzi was in the Vance car. He did not, however, return to his former greatness with that car, winning only once. The division had – since its inception – welcomed a number of other strong entrants. Essex Junction’s Joe Myers had bought Ray Lasnier’s beautiful Rusty Jones Firebird and run it successfully in the class for two years. 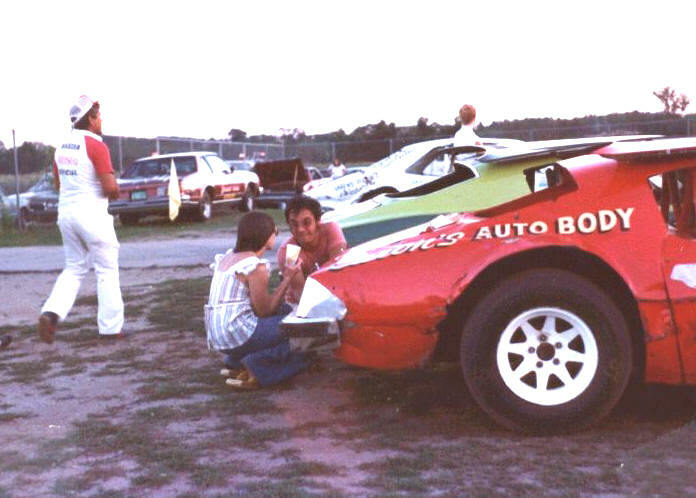 That car was then traded to Norm Andrews, who had suffered through a frustrating shot at the late models. Andrews, in turn, sold it to Joey LaQuerre towards the end of the division’s run in 1980. Larry Caron’s six cylinder Nova was groundbreaking in several ways, but he really raised hell with Waters’ Z28 Camaro, below. 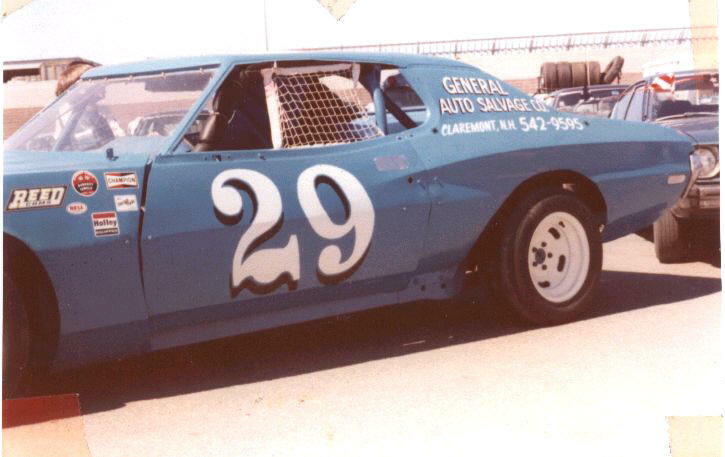 The Grand Americans would graduate such late model drivers as LaQuerre, Larry Caron, Barney McRae, Aube, Andrews, and even – to a limited extent – Jim Barton. Henry Van Acker would run in a late model class at Airborne. Buzzi chose not to spend much time in the upper divisions, probably due to budget considerations. 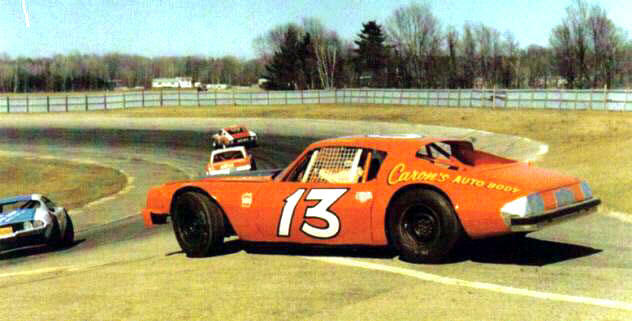 Caron, with help from Waters, would field a V-6 Nova late model sportsman which would run against the V-8’s at Catamount’s brief Friday night series around 1980. The car had many motor problems, and they switched over to a V-8; but, not long after, the late model tour went through a period when it was all the trend to have a six cylinder car for certain tracks. Besides a few years of some of the finest racing cars nobody paid much attention to, the notable legacy of the Grand Americans was in the upcoming “New Tigers”, a class that started up in 1982 and was just hitting good stride when Catamount closed in 1987. At first a hodge podge of everything from old street stocks, to old Grand Americans, to cars bought from other tracks, to even a few newly – built cars, the guys running their old Grand American cars were the class of the field until the newly – built Tigers started coming out of shops like Chuck Beede’s. 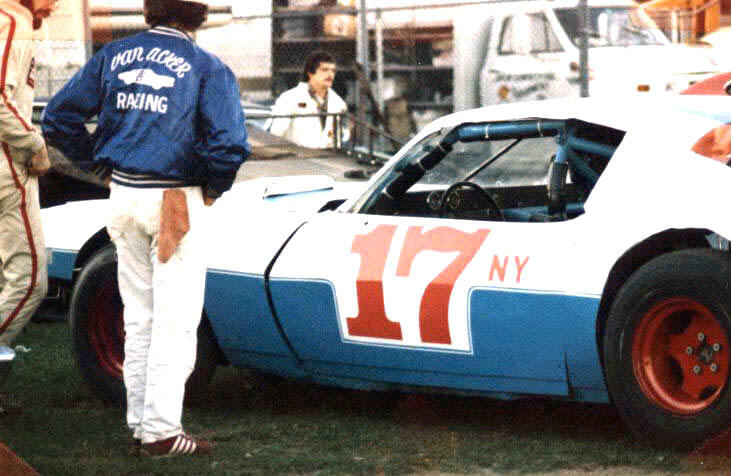 Henry Van Acker and crew prepare the always – clean Camaro 17NY, with fellow New York competitor Bob Wood in the background. Below – It didn’t always leave clean. Red Meade checks out the mess. When one looks at the feature winner lists in the division, it started out as a fascinating mixture. 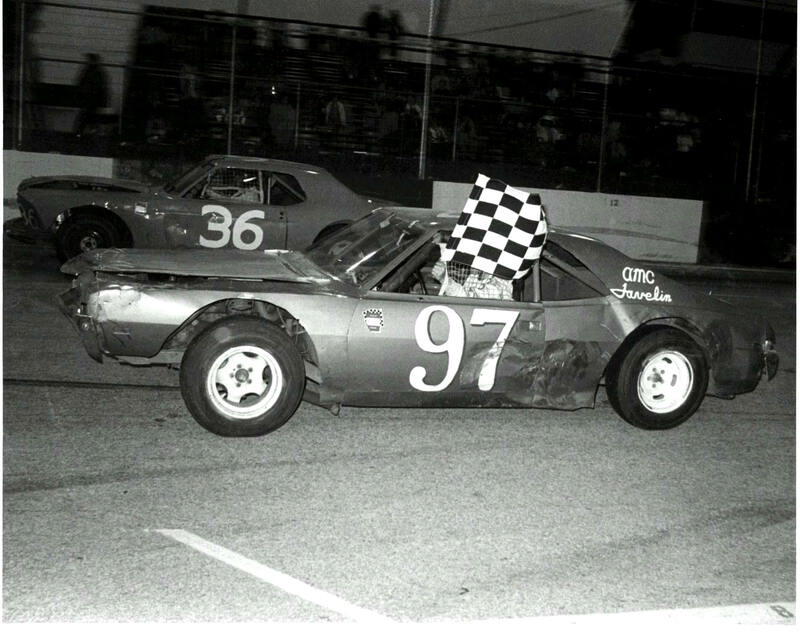 1977 and 78 saw Jay Yantz, Buzzi, Henry Van Acker, George McRae, Paul Donahue, Dave Gibbs, Brother Eastman, Larry Caron, Joe Myers, Jamie Aube, and even mini stock champ Harry Gammell winning. By the final year, which ahd only nine GA events, five were taken by Norm Andrews. The huge [Allen] lumbering street stocks became the only support show in town, and the Grand Americans were either relegated to behind garages and barns, or traveled off to other venues, as in the case of Joey LaQuerre and his ageless Firebird. No one can question what was accomplished with these little cars, and some of the division graduates are still active today. Aube actually still drives at Thunder Road, and the next generations of Donahues and Carons race with him. Not that they necessarily care much, but the management can look back and see guys like Larry Caron, Dave Gibbs, and Red Mead as Grand American drivers who had faithfully supported them in numerous support divisions since 1970. Seeing photos of beautiful cars like Ray Lasnier’s #60 Rusty Jones Firebird, Waters’s 28, Caron’s Z28, Sonny Gover’s #34 Camaro, or Henry Van Acker’s red, white, and blue 17NY gives testimony to just how much these guys cared. A good shot from the glory days of both the Grand Americans and Catamount Stadium. Below – The same laboring, a year later, at a dying Thunder Road. The class supported owner Tommy Kalimiris, but he was letting the place go to pot. Note the unmown lawns, sparse crowds, and unpaid drivers.